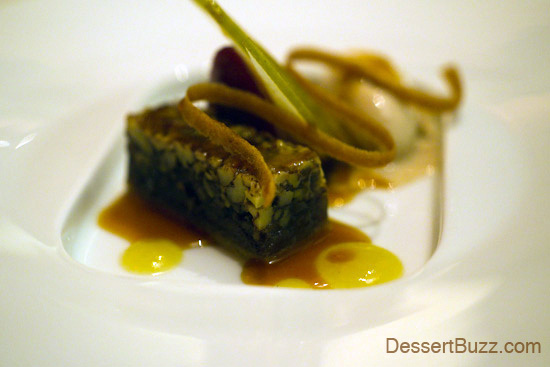 I recently checked in at Le Bernardin to see what their “new” Executive Pastry Chef, Laurie Jon Moran, was up to. It’s been about a year since he replaced Michael Laiskonis at the 3-star Michelin restaurant and I figured that was enough time for him to put his stamp on their dessert offerings. A quick glance at the menu supported the theory that it was now his alone, as there was no sign of Lasikonis’ iconic egg dessert. Mr. Laurie came to Le Bernadin after a recent two-year stint at Per Se. Before that he worked at Picholine and spent a number of years at Daniel. A short interview follows this feature. 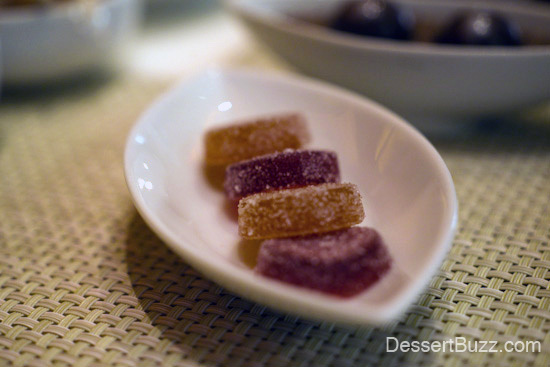 I visited Le Bernardin (LB) on two consecutive Saturday nights and sat in the lounge area. I found the banquette along the East side of the restaurant very comfortable. On both trips, I was seated right away after arriving just before 6:00 p.m. The lounge has its own menu of small plates, and during lunch you can also order from the Harvest Menu–at $45 maybe the best fine dining deal at the super high-end in NYC. You can also order from the main dining room tasting menus, and a number of couples seated around me were doing just that. First visit: After a few small savory plates, the best of which was the warm lobster brioche ($19), and an absolutely fantastic cocktail called “San Juan Viejo” ($18) with Don Q Anejo rum, mint verbena gomme and maraschino all spice dram, we settled in for 5 courses of desserts and petit fours from Mr. Moran. Cranberry maple – Poached local cranberries (Jansel Valley, MA) with cranberry gelee and sorbet, maple meringue, and maple syrup drizzled tableside (local maple syrup and maple sugar from Crown Maple, Dutchess County, NY), nepitella mint blossoms. The dessert was unusual in that the poached cherries were very tart. Personally, I loved this since I’m always looking for a break from sweet in my desserts. 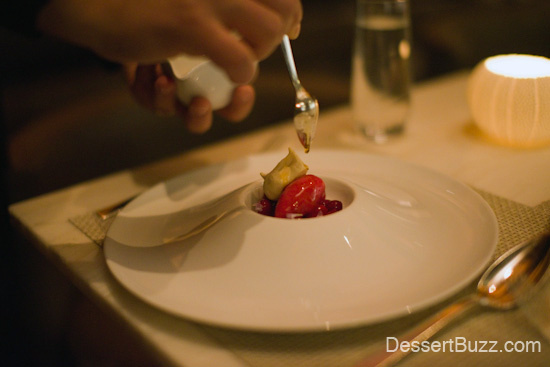 The extreme tartness of the cranberries was cut with the sorbet, maple syrup (poured tableside) and maple meringue–which is fun to eat because the texture is so unusual. Pecan Pear– Pecan tart, red wine poached pear, pearl coulis, candied pecans, pecan ice cream (made with homemade roasted pecan paste), sliced local Asian pear, bourbon caramel sauce. This may seem blatantly obvious but I’m going to say it anyway. If you like pecans and pears you will like this dessert. The former is offered in many different permutations, as a tart, candied and as the flavor of the ice cream. The texture of the tart is fantastic and has a very satisfying crunch. Note the cool fade of pecan density in the tart. That’s very pro! Unfortunately, my photograph does not capture one of the coolest elements of this dessert, the wave of chestnut cream under the gateaux. It’s far more pleasing to the eye than the standard “smear” of sauce. It’s more like a low, sculpted wave of chestnut cream. 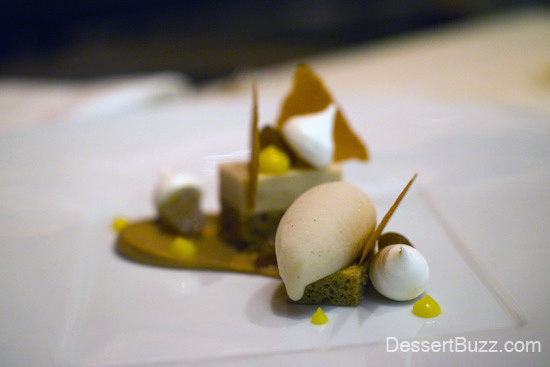 I’m not a huge fan of chestnut flavor or chestnuts, though I did like the chestnut gateaux and really liked the combination of the Meyer lemon puree drops, meringue and rum-vanilla sorbet. Hazelnut-marshmallow – Light Mast Brothers Sambirano Valley chocolate ganache, dehydrated chocolate mousse, chocolate-hazelnut daquoise, vanilla marshmallow, candied Piedmont hazelnuts, Piedmont hazelnut ice cream. This was my favorite dessert of the first visit. I though it was a beautiful, thoughtful and tasty. It’s also nice to eat a chocolate ganache and mousse dessert that doesn’t leave you feeling too full. It seems simple on paper but the crunch of a candied Piedmont hazelnut (the best in the world), coupled with vanilla marshmallows, chocolate ganache and dehydrated mousse is ultra-satisfying. I think it’s because of the vastly different textures and grades of sweetness. There was just enough of it on the plate to leave you satisfied but maybe wanting a bit more of something. Petit fours anyone? 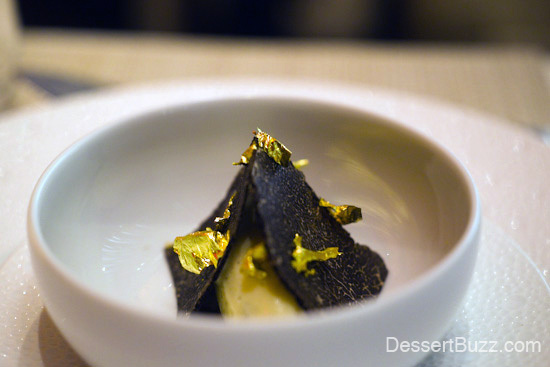 Tahitian vanilla Perigord truffle – Tahitian vanilla ice cream, slices of fresh Perigord truffles (small amount of cookie crumbs under), 24 carat gold leaf [off menu]. This small final dessert featured a slice of savory Perigord truffle, vanilla ice cream and golf leaf as an added “bling-factor” I found that the best way to experience the truffle was to let it slowly dissolve on your tongue for about 20 seconds–when I ate it fast I didn’t experience much flavor. I’m not sure how common it is for a customer to visit LB on consecutive weekends just to try all the desserts. Since I was with a new set of dining companions for my second visit, I thought Mr. Moran would send out at least one of the desserts from the previous week. After all, they would be new to everyone at my table but me. I thought wrong. 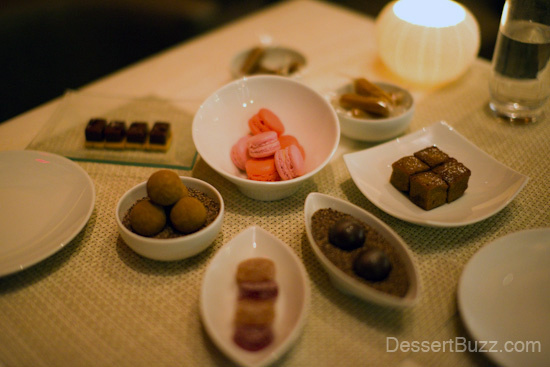 All four of the desserts–as well as one petit four–during my second visit were completely new! Maybe that was due to Mr. Moran’s Per Se lineage or maybe it was just his pride in being a top pastry chef. Either way, it was cool to see all the new dishes coming out. Blood orange Earl Grey – Blood orange sorbet, blood orange puree (made from confit of the whole fruit), blood orange gelee, Earl Grey biscuit, Earl Grey foam, micro lemon balm leaves. 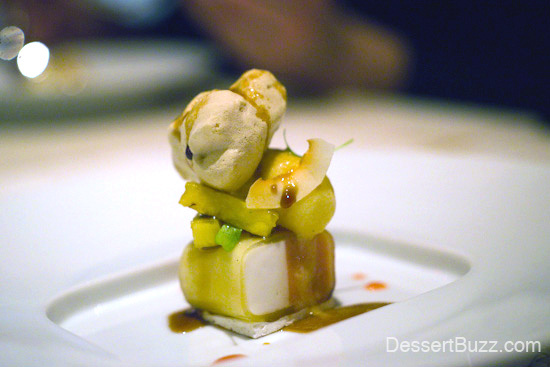 Like the previous week, the tasting started with a colorful, fruit and sorbet-centric dish. 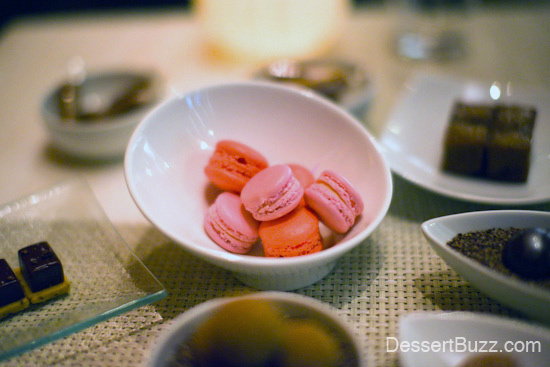 Also similar to the first week I though the color scheme was beautiful and inviting–it really got me excited for the rest of the desserts that evening. Instead of cranberries, this dish featured blood oranges done four different ways. The orange elements weren’t nearly as tart as the cranberries so the rest of the dish didn’t need to be as sweet to balance them. The Earl Grey biscuit and foam was decidedly neutral or “un-sweet “in a good way. 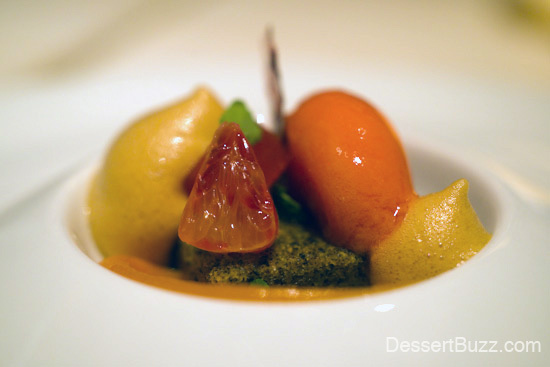 The only real sweetness in the dish came from the section of orange itself and the sorbet. Overall, a fantastic start to the second tasting. The exotic fruit vacherin was probably the most technically advanced dessert of the nine, owing to the coconut and guava sorbet that is (somehow) neatly wrapped by a thin band of pineapple agar gelee. This delicate base then has to support the weight of the rest of the components. It makes sense that the “puff” of super-light meringue sits at the top. I really enjoyed the acid and citrus pineapple flavors along with the sweet kokuto sugar and coconut. The coconut and pineapple elements reminded me of the taste profile of a pina colada. 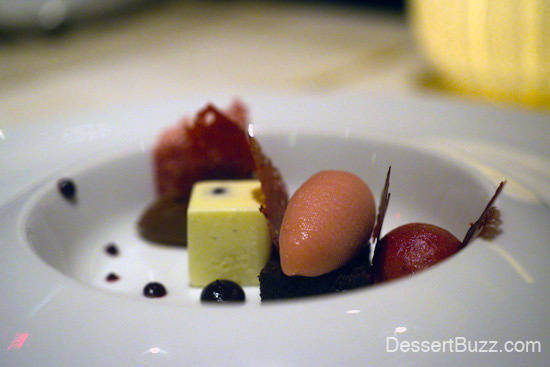 One of the cool things about this dessert is the decision to make it look a bit like modern architecture (the gelee wrapped sorbet reminds me of the condos surrounding the High Line). He could have easily just dumped all the same components in a cool looking bowl and it would have tasted just as good–but instead he went for the more visually stunning presentation. This is another dessert where the color palate seems to have been given as much thought as the flavor and texture profiles. A single spoonful of this dessert contains a multitude of perfectly matching textures, moist banana bread, malt mousse, cinnamon ice cream and a crunchy cinnamon tuile. The consensus of our table was that this dessert stole the show. No amount of description will be able to do it justice. Similarly, there is no way the photos capture the true beauty of this dessert. The only way to describe this deconstructed black forest cake is to say that all of the components are all part of a continum of flavors that span from tart and acidic to creamy and basic and then to sweet. 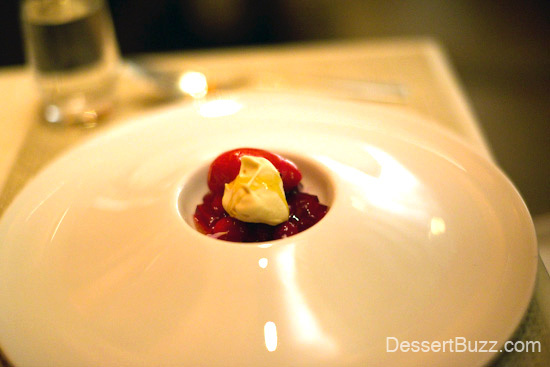 The kirsch-vanilla bavaroise has a brandied cherry suspended inside to go along with the other three cherry components that represent the cherry layer usually found in a common piece of black forest cake. A small slice of chocolate devils food packs a very strong chocolate flavor to compensate for its small size and represent the “cake” element. Petit fours – Vanilla caramels, passion fruit caramels, guava and rose mini-macarons, yuzu chocolate bon bons, liquid centered ‘old fashioned’ chocolate truffles, salted caramel-milk chocolate truffle rolled in roasted cocoa nibs, cranberry and passion fruit-banana pates de fruits and muscovado sugar financier salted caramel fudge sable. 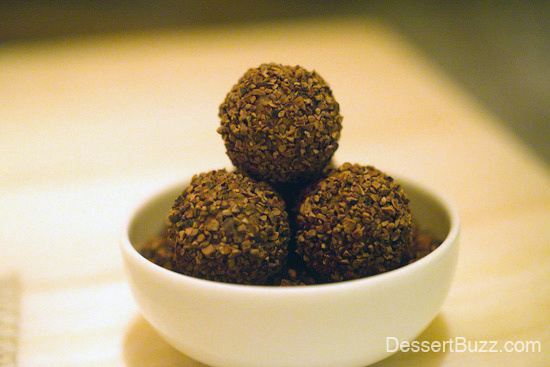 My favorite petit fours were the “old fashioned” truffles with liquid centers that we were instructed to eat “all at once”. Despite the busy Saturday night service, Moran made a brief visit to our table and answered some questions. A full bio is available here. DessertBuzz: How does it feel to finally be the Executive Pastry Chef after having been Sous Pastry Chef at Daniel and Per Se? Laurie Jon Moran: When you’re working as Pastry Chef or Sous Pastry Chef, even when you’re in a very collaborative [environment] and contributing to the menu, you are still working in the style of the Executive Pastry Chef vs. in your own style. Now [as the Executive Pastry Chef at LB] I have much more freedom. DB: How much latitude do you have with the desserts? Can you pretty much put any dessert you want on the menu? DB: Can you give an example of the type of collaboration? LJM: Just today, we worked on wine pairings for all the desserts on the menu with the sommelier team. DB: What about your team, has there been a learning curve working with them or getting them up to speed? LJM: I have two chefs that have been here 10 years and one who has been here 17 years so it’s a very experienced team. I didn’t need to rebuild the pastry program from the ground up–there was a lot of experience here. 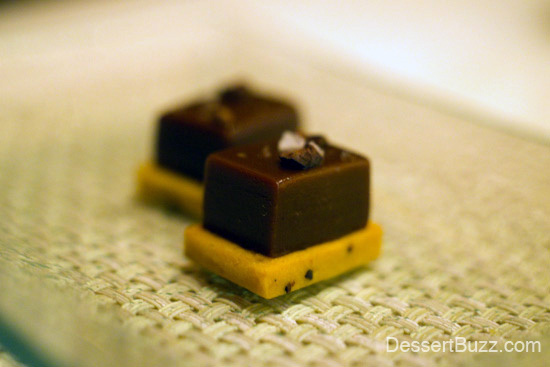 Fudge at a three-star Michelin restaurant?! Mon Dieu! DB: You worked a number of years at Daniel, which many have described as being run in the manner of a “traditional French kitchen”. 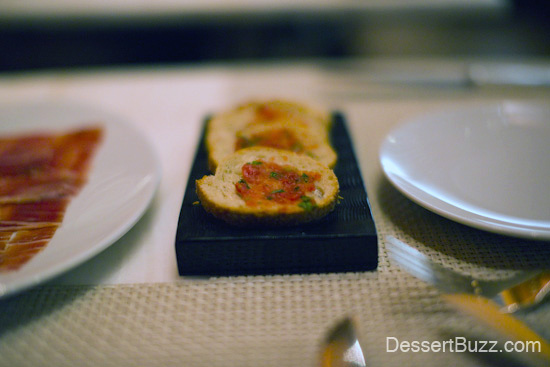 Is it the same or different at Le Bernardin? DB: The co-owner is a Buddhist! LJM: Yes [laughs] and really the restaurant takes on the personality of the person who is in charge and that’s true at Le Bernardin. DB: You mentioned you were planning some well-deserved time off. What are you doing? Going anywhere special? He’s been here a year and is already starting to find his unique voice at LB. Mr. Loran’s predecessor was the Executive Pastry Chef for nearly 8 years, I can only imagine (and look forward) to all that Mr. Moran and his team will create if he stays that long. 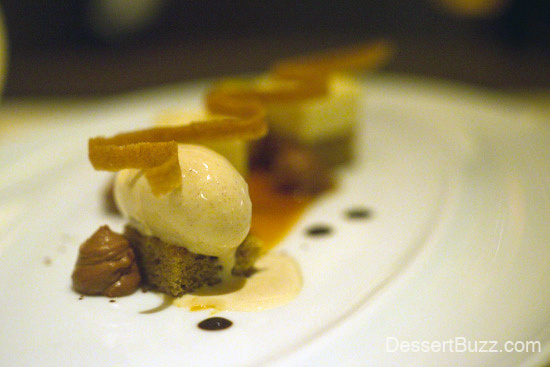 Follow DessertBuzz on Twitter to keep up on all the latest plated desserts from New York City’s top restaurants. Le Bernadin is located on 155 West 51 Street. Their website is here. 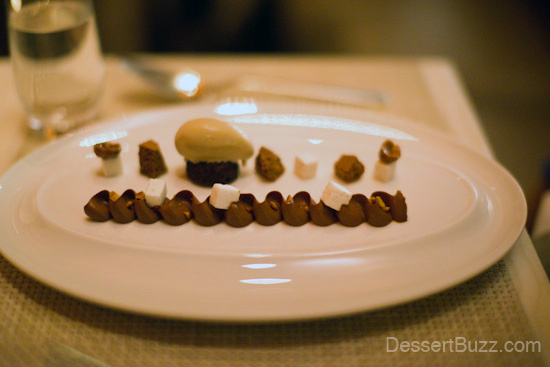 Our feature on Michael Lasikonis’ last desserts at Le Bernardin is here. An earlier tasting from Le Bernardin from 2011 is here. 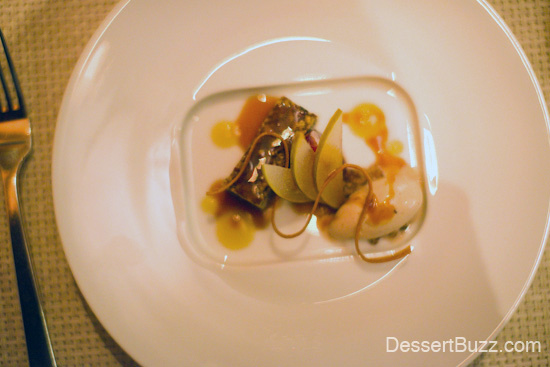 Does Le Bernadin offer a dessert tasting, or did you just do this a la carte? Couldn’t seem to find prices for desserts on the website’s menu? 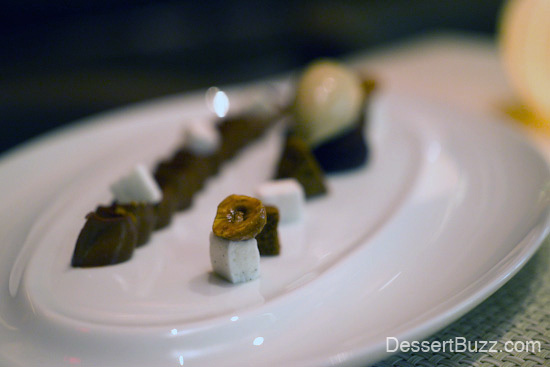 wonderful insight into the journey, philosophy, and textures of the dessert courses . i can almost taste it ..bravo.